I've been busy, but in a good way. I have been taking photos and gardening. We had two heavy frosts last week but today I planted tender plants like peppers, melons and tomatoes. My son had planted three extra squash plants in my garden because they were flowering. We both lost them all in the two frosts. It is apple blossom time and lilac time. The air smells like heaven. 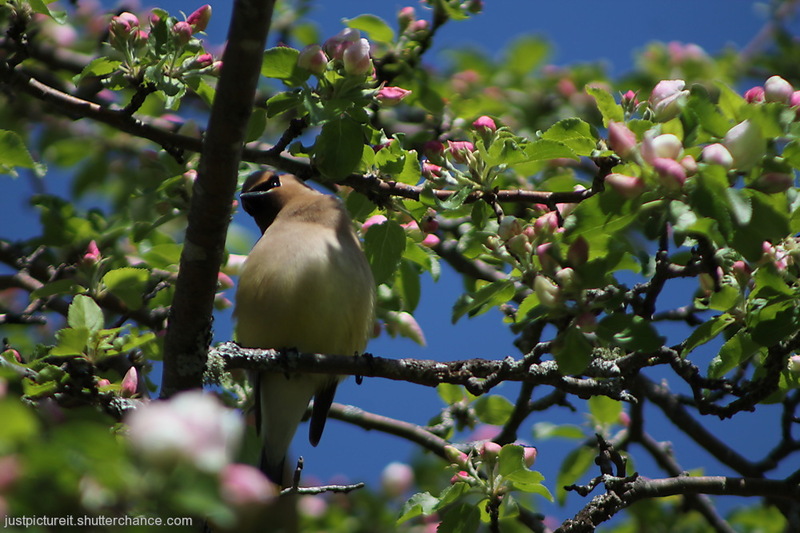 The apple brings a large variety of birds but the cedar waxwings come in flocks. I have been field walking, taking in wonderful spring landscapes. Today I was at a pond fishing party. I have nothing new uploaded. Sheesh! Let's call this Mumbo Jumbo week. Apple blossom time is always a good time, Mary. We are in rice sowing time. I love your photo's of the Waxwings! They are so gorgeous! Joli petit oiseau. Ton jardin doit être très beau. I love this image very much! I love your words "The air smells like heaven"! Very well spotted Mary! I love the bird's pose. What a fine shot Mary, you sound as if you've been a busy lady in the garden. Lovely shot of a bird we see only rarely, Mary - sounds like you've had a good week!